Flatland Multiverse is a mash up of the concepts of Flatland and the Multiverse. If you've read the book Flatland by Edwin Abbott then you are aware of the premise of a universe limited to two dimensions: length and width. In Flatland Abbott writes of this world of only two dimensions as a means of introducing the concepts of relativity and spatial dimensionality. If you follow cosmology, you should be aware of the concept of the multiverse - an aspect of string theory that opens up the mathematical possibility of the simultaneous existence of an infinity of universes - which would in effect reduce the significance of our own universe from being all there is to being just another grain of sand on a beach of universes. In Flatland Multiverse, I've combined the idea of a two dimensional universe with that of a multiplicity of universes. 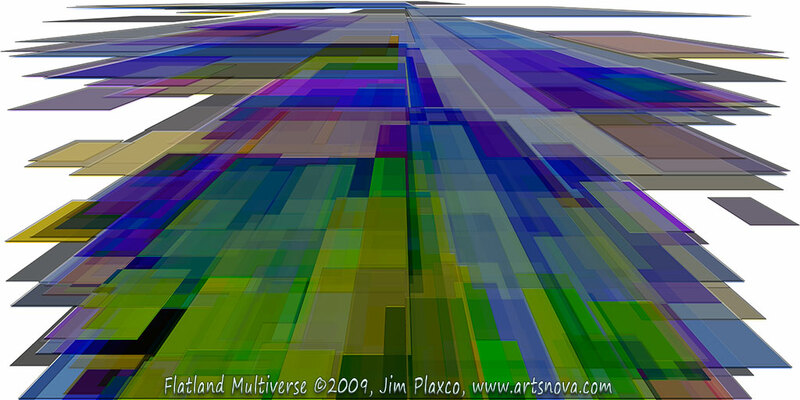 Flatland Multiverse is a visualization of such a multiverse as viewed by a being on a higher plain of existence. A watermarked wallpaper of this print can be seen in the Flatland Multiverse wallpaper.